A guest strip from Jesse Lax with a difference today. This is a multi part guest run and will fit into the regular continuity when it's done. It all started because I suggested that Jesse should read the Infinity Doctors and he adored it. Which took us into a conversation about just which Doctor it was written for. 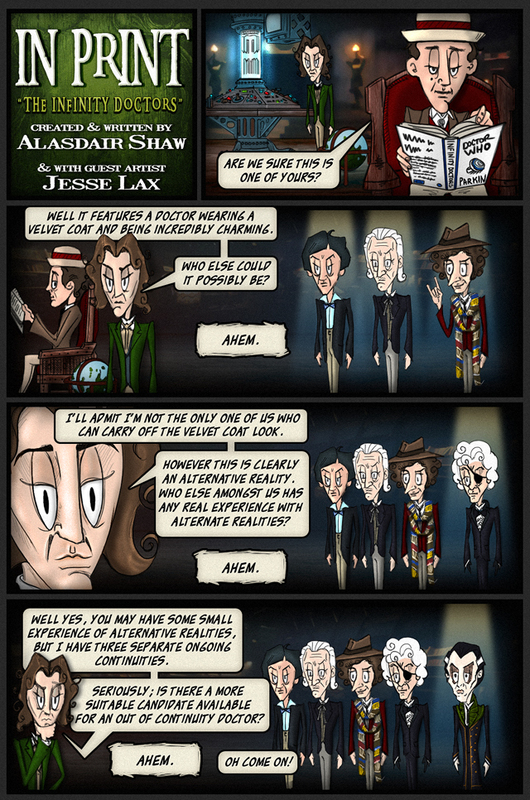 We soon branched out from the five candidates in today's strip and discussed the Shalka Doctor. The Shalka Doctor was created for an official BBC webcast and was the official 9th Doctor for a very short time. If you haven't seen Scream of the Shalka then follow the link to the official BBC page. If you want to know more about out of continuity Doctors then you can go and read an article I wrote for Kasterborous. Talking of things I wrote; Setting Stones saw the light of day at Inferno Fiction this week. If you've been following my blog you'll have known it was near completion and now you can read it for yourself. In keeping with today's strip it features a cover by Jesse. I'd love to know what you thought of it. Feel free to Email me with your comments. In other news we opened a poll this week to see if you guys wanted to see In Print, well, in print. So far the response has been less than inspiring. Please feel free to go and vote, we'd love to get a book out there, but we need numbers to justify printing. Oh and let's not forget Jim's blog. He fills it with such pretty picture. Infinity Doctors is a fantastic novel. However it was an 8th Doctor Story. 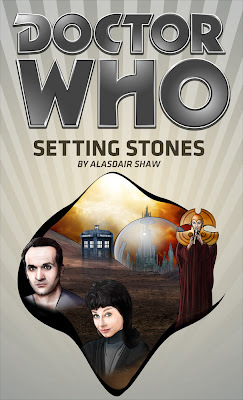 At the time BBC would publish two novels each month, one 8th Doctor, and another being a past Doctor Adventure. Given I was collecting every single one of them, I can promise you that it was published as part of the 8th Doctor line. I was always led to believe that it belonged to the Past Doctor line of books. Specifically that is was the PDA for November 1998. Doctor Who is one of my favorite science fiction drama series. And The Infinity Doctors is based on that. That's really interesting. I would definitely read the novel as soon as possible. Thanks for sharing.